Click on the picture to play and learn! Scroll down the page to find out lots more! Designing and building a bridge to withstand earthquakes is no easy challenge. 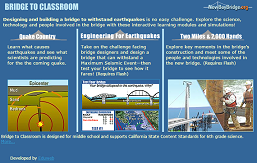 Explore the science, technology and people involved in the bridge with these interactive learning modules and simulations! 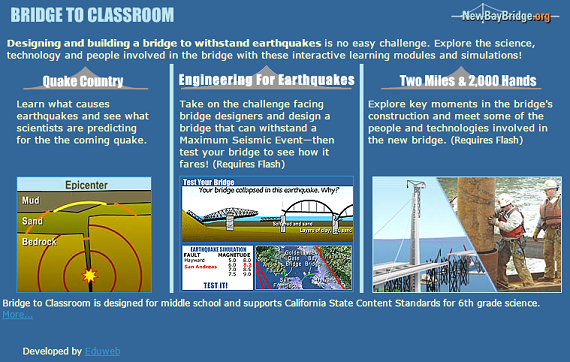 Test your bridge against earthquakes of different magnitudes from different directions! Go back and try again, if you need to. Two Miles Animation of how the bridge will span two miles. Learn about Geofill, the Skyway and its precast segments, Self-Anchoring Suspension Cables, Shear Links, liquefication, and more; by clicking on the icons! 2,000 Hands Meet some of the 2,000 people working on the bridge. 12 different jobs are explained by people who do them. On September 2, 2013, the new East Span of the San Francisco-Oakland Bay Bridge opened to traffic. Watch the bridge's construction from start to finish in this time lapse video, which compresses nearly six years of around-the-clock construction activity into a dizzying four minutes.